In the course of her considerable experience in events design, styling and training over several years, the author, Kehinde Apampa has compiled an array of stunningly beautiful photographs into this forthcoming coffee-table style book in large (8 ½ X 11) format with content in full colour. She provides valuable subject matter and content for event decorators and event managers, and indeed anyone planning social events to commemorate special occasions. 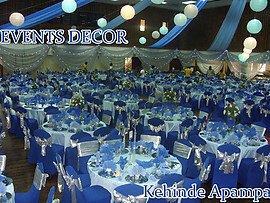 EVENTS DÉCOR covers a wide spectrum of ideas on event decoration. It is a collection of Indoor and outdoor decorations, corporate decoration, wedding decoration, African themed decoration, décor for funeral parlors, etc. Various forms of accessories for decorations are presented in vibrant colours in the book. For Wedding decorations the use of fresh flowers, permanent flowers, candles, balloons and fabrics are predominant while corporate décor are themed around the nature of the event, the corporate colors of the organizers and their company’s mission statements. The use of African mats, bamboo, earthen pots, African prints, and calabashes characterize African themed decorations. Fresh flowers, lights and fabrics are used for wreaths in décor for funeral parlors. Other accessories used include twinkle lights, Chinese paper lamps, fresh fruits, danglers, ticky touch, African guitars and props. This book will also serve as a guide to selecting colors for events and having chosen colours well-coordinated together for a wholesome visual effect. Events Décor is currently in production scheduled for release later in the year and will be available for order on this site as well as through all major on-line stores including amazon.com.